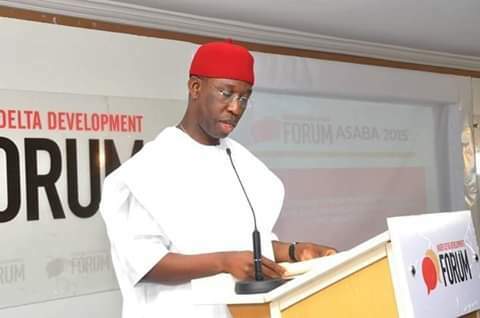 Ifeanyi Okowa lauded the important role played by Anioma men and women towards the UNITY of ANIOMA people. The governor said his administration would sidetracked ANIOMA -- Ukwuani/Ndokwa, Enuani, Ika -- dialect teaching in primary schools, and bring forth IGBO CENTRAL LANGUAGE (Igbo izugbe) in all schools in Anioma as to bring out Anioma people's Igbo beautiful nuances and values. He made the pledge yesterday while speaking with PEOPLES DEMOCRATIC PARTY (PDP) and IZU ANIOMA (IA) team at Asaba, Delta state capital to resuscitate IGBO language, tradition and culture in the region. "I appreciate our coming here, but we have to thank CHUKWUOKIKEABIAMA for success at poll, "Okowa said. The peoples Democratic party and IZU ANIOMA team lauded him for the initiative and assured the governor of ever ready to taking the IGBO LANGUAGE STUDIES to their respective locals. This news is from The Biafran News..